This article is about the fictional comic book character. For any other use, see Bizarro (disambiguation). Bizarro (/bɪˈzɑːroʊ/) is a fictional supervillain appearing in American comic books published by DC Comics. The character was created by writer Otto Binder and artist George Papp as a "mirror image" of Superman and first appeared in Superboy #68 (1958). Bizarro the opposite of Kal'l on the cover of Action Comics #785. Art by Ed McGuinness. Debuting in the Silver Age of Comic Books (1956 – c. 1970), the character has often been portrayed as an antagonist to Superman, though on occasion he also takes on an anti-hero role, and appeared in both comic books and graphic novels as well as other DC Comics-related products such as animated and live-action television series, trading cards, toys, and video games. Bizarro debuted in Superboy #68 (cover-dated October 1958, but on sale in August), writer Otto Binder casting the character as a Frankenstein's monster pastiche that possessed all the powers of Superboy. Shunned for his unenviable appearance, the teen version of Bizarro only appeared in a single comic book story. An adult version appeared around the same time in the Superman daily newspaper comic strip written by Alvin Schwartz, debuting in Episode 105: "The Battle With Bizarro" (strips 6147-6242: August 25, 1958 to December 13, 1958). According to comics historian Mark Evanier, Schwartz long claimed that he originated the Bizarro concept prior to the character's appearance in Superboy. The newspaper storyline introduced the strange speech patterns that became synonymous with the character, with all of Bizarro's comments meaning the opposite (e.g. "bad" means "good"). The newspaper version wore a "B" on his chest, as opposed to Superman's distinctive "S". I was striving, you might say, for that mirror-image, that opposite. And out of a machine which would reveal the negative Superman, came the mirror image — always remembering that in a mirror everything is reversed... The times were such that one-dimensional characters, your standard superheroes, even in comics, seemed rather simplistic, like paper cut-outs. What was demanded was the full dimensional personality — a figure that carried a shadow, if you like. I was certainly inspired to some degree also by C.G. Jung's archetype of "the shadow" — and Bizarro certainly reflected that, as well. Binder introduced the adult version of the character into the Superman comic book, this time wearing an "S," in Action Comics #254 (July 1959). Bizarro proved popular, and eventually starred in a Bizarro World feature in Adventure Comics for fifteen issues, running from issue #285-299 (June 1961 – August 1962), as well as in a special all-Bizarro 80-Page Giant (Superman #202, December 1967/January 1968). The character made forty appearances in the Superman family of titles — Action Comics, Superman, Superman's Pal Jimmy Olsen, Superman's Girl Friend, Lois Lane, Adventure Comics, Secret Society of Super Villains, and DC Comics Presents – from 1959 to 1984, prior to a reboot of the DC Universe as a result of the limited series Crisis on Infinite Earths #1 – 12 (April 1985 - March 1986). Bizarro was reintroduced into the DC Universe in a one-off appearance with characterization similar to his original Superboy appearance in The Man of Steel #5 (December 1986). He was later revived in the "Bizarro's World" serial that ran through the Superman titles in March and April 1994, and in Action Comics Annual #8 in 1996. An unrelated four-issue limited series titled A. Bizarro (July–October) was published in 1999. Yet another version was introduced during the "Emperor Joker" storyline in September–October 2000. Remaining in DC Comics continuity, this Bizarro continued to make semi-regular guest appearances that firmly established the character as part of the Superman mythos. General Dru-Zod had originally created bizarro duplicates of himself to dominate the planet Krypton. The bizarros had no power because they were not under a yellow sun, but they were soldiers ready to kill and die without hesitation. This was the reason why Zod was banished to the Phantom Zone for 25 Krypton sun-cycles. Some 12 years later, totally oblivious to these facts, a scientist on the Earth is demonstrating his newly invented "duplicating ray" to Superboy, and an accident causes the ray to duplicate the superhero. The copy, quickly labeled "Bizarro", is a flawed imitation as it possesses chalky white skin and childlike erratic behavior. Shunned by the people of Smallville, Bizarro befriends a blind girl, and loses all hope when he realizes that the girl did not shun or flee from him because she was blind. Superboy is eventually forced to "kill" the "less than perfect" clone, using the remains of the duplicating machine, which acts like blue kryptonite (as opposed to green kryptonite, Superboy's weakness) on the copy. The whole business proved unexpectedly easy as Bizarro deliberately destroyed himself by colliding with the duplicating machine's fragment. The ensuing explosion miraculously restores the girl's eyesight. Years afterward, Superman's arch-foe Lex Luthor recreates the "duplicating ray" and uses it on the hero, hoping to control the duplicate. The Bizarro that is created, however, is confused, stating: "Me not human... me not creature... me not even animal! Me unhappy! Me don't belong in world of living people! Me don't know difference between right and wrong — good and evil!" Luthor is arrested by Bizarro for re-creating him, but forgotten as Bizarro attempts to emulate Superman, creating havoc in the city of Metropolis and almost exposing Superman's secret identity as Clark Kent. When Bizarro falls in love with reporter Lois Lane, she uses the duplicating ray on herself to create a "Bizarro Lois", who is instantly attracted to Bizarro. The Bizarros leave Earth together, determined to find a home where they can be themselves. Superman encounters the couple once again, discovering that Bizarro – now called Bizarro #1 – has used a version of the duplication ray to create an entire world of Bizarros, who now reside on a cube-shaped planet called "Htrae" (Earth spelled backwards). Bizarro #1 and Bizarro-Lois #1 also give birth to a child who, while super-powered, appears to be totally human. Considered a freak by Bizarro standards (out of resentment for the way he was treated by Earth humans, Bizarro #1 made a law that they must act the opposite of humans, causing no end of lunacy), the child is the catalyst for a brief war between Htrae and Earth. Blue Kryptonite is also invented during this war, as well as the temporary existence of Bizarro-Supergirl. Bizarro also has a series of adventures on Htrae, aiding a normal Jimmy Olsen when he is accidentally trapped there, preventing an invasion of blue kryptonite statues, and stopping the Bizarro version of Titano. Bizarro's influence is also felt on Earth: Jimmy Olsen is inadvertently turned into a Bizarro for a while, and a new teen version of Bizarro travels to the 30th century and attempts to join the Legion of Super-Heroes. When he is rejected by the Legion, the Bizarro teen creates his own Bizarro version of the Legion, which Superboy eventually persuades him to disband. When Bizarro encounters Superman once again, his powers are now the opposite of Superman's (such as freeze vision as opposed to heat vision and heat breath rather than freeze breath), and he attempts to kidnap Lois Lane. Bizarro also temporarily joins the Secret Society of Super Villains to battle the Justice League of America and Captain Comet. Bizarro appears in the Alan Moore-scripted "Whatever Happened to the Man of Tomorrow? ", in Superman #423 (September 1986). Bizarro goes berserk and destroys the Bizarro World and its inhabitants, then travels to Metropolis and wreaks havoc before abruptly committing suicide. This and many other deaths turn out to be the machinations of Mister Mxyzptlk, who had begun a rampage of crime. Superman is unable to undo the deaths, but kills Mxyzlptlk and then uses gold kryptonite on himself. Bizarro's final pre-Crisis appearance was in DC Comics Presents #97 (September 1986), which was also the final issue of that series. After being empowered by a hideously disfigured Phantom Zone sorcerer, Mr. Mxyzptlk destroys Zrfff and then causes the Bizarro world to implode, killing all its inhabitants. Bizarro's severed head crashes onto Clark Kent's desk and addresses Clark Kent before his simulated life ends. Bizarro does not appear in the Crisis on Infinite Earths, apparently because of this story's events. This story directly contradicts a World's Finest story where it is revealed that sometime in the future, Htrae is transformed into a more normal world (egg-shaped rather than cubical) by the radiation from an exploding celestial body. The Bizarros are changed into normal people without powers, but still retain vestiges of their Bizarro laws (curtains hung outside the windows of a house, etc.). After the events of Crisis on Infinite Earths, Lex Luthor orders his scientific team to create a clone of Superman. Incorrectly starting from the assumption that Superman is a human with metahuman abilities (his alien origin had not yet been revealed), the process results in a flawed copy, which Luthor dismissively refers to as "...this bizarre -- Oh, forget it", before ordering for the subject to be disposed of. The clone survives and, although mute and possessed of only limited intelligence and vague memories of Clark Kent's life, attempts to mimic Superman. He kidnaps Lois Lane and is finally destroyed when colliding with Superman in mid-air. Each time he exerted himself, the clone crumbled slightly. When Lois Lane's sister, who had been blinded in a terrorist attack, is exposed to Bizarro's dust, she regains her sight. While Superman had not expected this effect, he speculated that Bizarro heard the sister explain her partial recovery and may have deliberately allowed himself to be killed in order to cure her. The new "Bizarro" on the cover of Action Comics #785 (January 2002). Art by Ed McGuinness. A second Bizarro, able to speak and think better due to genetic engineering by Luthor, appears in a 5-issue substory in the clone plague story-arc titled "Bizarro's World" (beginning in Superman #87). Before he died, this Bizarro seriously injured Happersen, kidnapped Lois, created a ramshackle dummy version of Metropolis in a warehouse (to parody Superman's frequently rescuing Lois, he deliberately exposed her to and "rescued" her from one lethal danger after another), abducted Lana Lang, proposed to Lois and finally died in Luthor's labs. During this period, Superman also had to cope with an unending increase in his powers due to exposure to "purple kryptonite" in the climax of the Death of Superman and Reign of the Supermen story-arcs. One other Bizarro is created using Lex Luthor's clone process, by Lex Luthor's estranged wife and Dabney Donovan shortly after Superman regained his normal powers when he expended his electromagnetic ones. This Bizarro abducted Lex Luthor's baby daughter and intended to send her by rocket to another planet, emulating Kal-El's escape from Krypton. His pile of explosives and bombs, meant to launch the rocket, would have killed her instead, and Superman had to shield her when Bizarro threw the launch switch. Bizarro 2, already self-destructing from a genetic booby trap encoded into him by his creator, perished in the explosion. Another version of Bizarro possesses all the abilities of Superman but with a childlike mentality and method of speech. He is created by Batman's arch-enemy the Joker when the villain steals the powers of the fifth-dimensional imp Mr. Mxyzptlk. Creating a twisted version of Earth called "Jokerworld" — a perfect cube with Joker's image on each facet — the villain designates Bizarro to be the planet's greatest hero and leader of a reimagined "JLA" (the "Joker's League of Anarchy"). When Mxyzptlk regains his powers, the imp allows Bizarro and several other beings to remain on the restored Earth. Bizarro suffers a setback when captured by the Pokolistanian dictator General Zod. Zod beats and tortures Bizarro, simply because the creature resembles Superman. The hero rescues Bizarro, and to help him adjust to the normal Earth rebuilds Bizarro's "Graveyard of Solitude" (the opposite of Superman's Fortress of Solitude). During the Infinite Crisis, Bizarro is tricked into joining the reformed Secret Society of Super Villains by Flash's foe Zoom. In a battle with superteam the Freedom Fighters Bizarro accidentally kills the Human Bomb, repeatedly hitting the hero to see the flashes of light that are produced from the kinetic energy of the blows. Bizarro becomes involved when Kryptonian criminals, led by General Zod, escape to Earth. Wishing to create a home for himself, Bizarro travels into deep space to a solar system occupied by a blue sun. After creating a cube shaped planet, filled with distorted versions of various buildings and locations on Earth, Bizarro is still lonely. The blue sun, however, gives Bizarro a new ability called "Bizarro Vision", which allows him to create new Bizarros. When this fails, Bizarro kidnaps Jonathan Kent, Superman's adopted father on Earth. Superman rescues his father and helps Bizarro become his world's greatest hero. Bizarro eventually appears on the planet Throneworld, befriending and aiding Earth hero Adam Strange and allies Prince Gavyn, Captain Comet, and the Weird. Together they participate in the war between alien worlds Rann and Thanagar, and against villains Lady Styx and Synnar. Bizarro eventually visits the grave of a deceased Jonathan Kent, and is then sent (by rogue Kryptonians) with other Superman foes to the inter-dimensional prison, the Phantom Zone. Bizarro has a series of encounters with former Secret Society ally Solomon Grundy, and during the events of Blackest Night, Bizarro confronts the Black Lantern version of Grundy. Bizarro destroys Grundy by driving him into the heart of the Sun. Later, while investigating an object that crashes into a Metropolis park and leaves a massive crystallized crater in its center, Dr. Light and Gangbuster discover a Bizarro-like creature that resembles Supergirl. The Bizarro Supergirl takes the heroes hostage, but is defeated in battle by the real Supergirl. It is revealed that the Bizarro Supergirl is a refugee from the cube-shaped Bizarro World, and was sent to Earth by her cousin after their planet was attacked by a being known as the Godship. Dr. Light attempts to take the Bizarro Supergirl to S.T.A.R. Labs, only to be violently knocked unconscious by Supergirl, who then absconds with her doppelganger and her ship, hoping to stop the Godship and save Bizarro World. After taking Bizarro Supergirl back to Bizarro World, Bizarro Superman is reunited with Bizarro Supergirl. In The New 52 (a 2011 reboot of the DC Comics universe), Bizarro first appears in the Forever Evil event. Five years ago, Lex Luthor, intending to create his personal army of Supermen, attempted to splice Superman's DNA with human DNA and injected it into a teenage test subject. Instead, he transforms into a hulking white-skinned monster with cryonic vision, incendiary breath, and immunity to Kryptonite — deducing his weakness, Luthor hits him with concentrated solar radiation that oversaturates his cells and kills him. Luthor then takes samples of the creature to continue his experiment, deciding to clone a purely Kryptonian body. Five years later, a capsule labeled B-0 is shown. After the Crime Syndicate takes over the world, Luthor releases Subject B-0, though his transformation is only halfway through. When he kills a security guard named Otis on Luthor's orders, Luthor is pleased and decides to use the imperfect clone in his plan to take the Syndicate down. Later, when Luthor and his team of villains pass through a tunnel, B-0 is revealed to be afraid of darkness. Luthor tries to comfort him with a story about his own fears, but ultimately wonders whether the clone was a waste of time; B-0 then speaks his first words, "Bizarro... try", much to Luthor's surprise. Though initially doubtful, Luthor grows truly fond of "Bizarro", who proves to be a powerful asset throughout the event. During the final confrontation against the Earth-3 invaders, Bizarro battles Mazahs, the alternate version of Luthor himself; although he initially has the upper hand, Bizarro is fatally wounded and left to die. Luthor desperately tries to fix him, to no avail, and they share a sorrowful goodbye. Enraged over the death of Bizarro, Lex Luthor murders his Earth-3 counterpart, avenging Bizarro. After the battle is over, Luthor restarts the cloning process; when one of his scientists states it should take about ten years to fully develop a perfect Kryptonian clone, Luthor corrects him by saying it will take only five years, revealing he truly intends to create a perfect copy of Bizarro. In the "DC Rebirth" reboot, a clone of Bizarro is found inside of a tube in a train car stolen by Black Mask sometime after the Crime Syndicate of America incident. Red Hood and Artemis jump aboard the train car attempting to steal a weapon, not expecting it to be a clone of Superman. Bizarro eventually joins Red Hood's Outlaws. During this time, Bizarro is stricken with a sickness which causes his cells to rapidly deteriorate. After saving his teammates in the Outlaws, he dies. Lex Luthor takes his body to try to resurrect him, on the condition that he be the property of Lexcorp. This results in Bizarro becoming extremely smart, surprising his teammates. "Bizarro telescopic vision" which allows Bizarro to see a "short distance behind his head" rather than a "long distance in front of his head"
"Bizarro microscopic vision" which makes objects "actually smaller to everyone" rather than merely "appear to be bigger to only the user"
"Bizarro X-ray vision" which allows Bizarro to "only see through lead" rather than the ability to "see through anything except lead"
"Telescopic X-ray vision" which caused Bizarro to shoot x-rays from his eyes from "fifty miles around". This also applies to weaknesses, as Bizarro is vulnerable to blue kryptonite, as opposed to green kryptonite, which is lethal to Superman. Bizarro is actually strengthened by green kryptonite as opposed to blue kryptonite. The limited series All-Star Superman (January 2006 – October 2008) features Bizarro clones from an alternative universe called the "Underverse". They can "infect" a normal human and change them into a Bizarro clone by touch. One of these creatures is called "Zibarro" and is unique in that he has intellect and a roughly human appearance, traits which he considered to be sources of scorn from his fellow Bizarros, resulting in a social isolation and loneliness he attempted to combat through artwork. When Superman was stranded in the Underverse, Zibarro helped him marshal the other Bizarros into building a rocketship that could send Kal-El home - Zibarro briefly considered taking Superman's place in the rocket, but realized he had no way of knowing he would find any more acceptance among humans than his kinsmen. Before leaving, Superman advised him that rather than an aberration, Zibarro may be evidence of increasing intelligence on the part of Bizarro-Home, and encouraged him to keep up his work; Superman had a segment of Zibarro's poetry preserved in Superlaminite within his Fortress of Solitude after returning home. An amalgamation of Bizarro and Carnage, Bizarnage was made through a botched experiment at Project Cadmus in an attempt to replicate alien DNA. The white, goopy creature they created went crazy and began destroying everything and everyone in its way. Then Spider-Boy arrived and battled him. Bizarnage wanted to be Spider-Boy, so he tried insanely to kill him, but was eventually defeated by getting tricked by Spider-Boy and sucked into an energy containment unit. Bizarro appears in an issue of the tie-in comic for the late-1980s Superboy TV show, in which he is duped into acting as a student's art project. He also was featured in an issue of the Superman Adventures comic series that tied into Superman: The Animated Series in which he is brought to Earth by Lobo. A Bizarro fantasy akin to the pre-Crisis version appears in the 1998 Adventure Comics 80-Page Giant by writer Tom Peyer and artist Kevin O'Neill. There, Bizarro demands that a technician at a SETI-like installation broadcast his diary. Having no choice, the technician looks over the diary, which tells the story of the classic cube-shaped backwards Bizarro World. Superman accidentally finds himself there and, to allay people's fears of him, goes on a "constructive rampage." The original Bizarro, a.k.a. Bizarro #1, goes to Earth and attempts to stop Superman with the help of his friends. However, when the other Bizarros try to kill Superman, #1 stops them, saying that killing is the earthly thing that they must, above all, do the opposite of. Realizing that, however strange the Bizarro World might be, its inhabitants are safer and happier than those of Earth thanks to Bizarro #1's leadership, Superman apologizes. To show his sincerity he hides a copy of the Bizarro Code where nobody will ever see it. The people hold a parade in #1's honor and with his loving wife Bizarro Lois #1 and their son, Bizarro Junior #1 at his side, Bizarro cries saying "Me am ... happiest creature in universe." When the technician finishes reading the story, he sees Bizarro is gone and, horrified, asks – what if the journal itself is no exception to the Bizarro Code? Elsewhere, the truth is revealed; Bizarro, who has no home and no family and is held in contempt by Superman, weeps because he is the most miserable creature in the universe. In the 2004 graphic novel mini-series Trinity by Matt Wagner, Bizarro is a genetic clone of Superman that is the result of Luthorcorp's "Project Replica". The creature was then sealed away in the frozen wasteland of Antarctica, encased within ice, until it was released by Ra's al Ghul, who used him as a pawn in his plan to use nuclear warheads to decimate Gotham as well as destroy a cluster of communication satellites, causing a major communications blackout, the end goal of his mission being to incite chaos and purge the Earth of the "cancer" that is civilization. After he is injured by Batman's use of a suit of armour and solar pulse lasers, Bizarro's hand is removed by Superman's heat vision before his template throws him into a volcano. This Bizarro is presumably deceased, however, his hand is turned into red kryptonite at the bottom of the ocean. A story in the out-of-continuity digital-first anthology comic book Adventures of Superman from 2013 by Christos Gage and Eduardo Francisco reveals that Bizarro's penchant for opposites comes as a result of his imperfectly formed brain, a discovery which allows Superman and Professor Hamilton to make him talk and think like a regular person and pursue his desire to be heroic. The 2002 graphic novel Bizarro Comics is an anthology of short comics by artists of the independent scene handling various DC Comics characters in humorous tales set outside of any continuity. 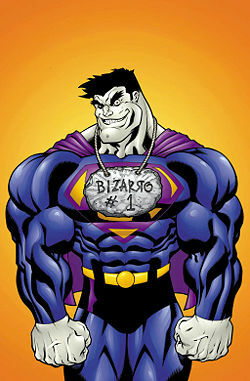 All the stories are bookended by Bizarro Wars, a comic written by Chris Duffy with art by Stephen DeStefano in which Mxyzptlk seeks the aid of Superman to save the fifth dimension from a cosmic conqueror named "A", but ends up with Bizarro (here introduced as a new character that neither Superman nor Mxyzptlk formerly knew of) instead. The other comics in the volume (including one short Bizarro World story written by Bizarro creator Alvin Schwartz) are presented as creations of the deranged mind of Bizarro himself. The 2005 follow-up anthology Bizarro World features the character less centrally, but includes an introductory story in which the character runs an amusement park. On Earth 2 as part of The New 52 (a reboot of the DC Comics universe), Darkseid and Steppenwolf created a clone of Superman which they dub Brutaal. After being snapped out of Darkseid's control by his wife Lois Lane (who in this reality inhabits the wind-manipulating robot body known as Red Tornado), Superman and Red Tornado leave for the Kent Family's farm. After a protracted battle with Earth 2's superheroes, in particular Green Lantern (Alan Scott) and a younger Kryptonian named Val-Zod, he is revealed to be scaling and decomposing. Realizing he is a Bizarro-type clone and that his power is waning, the Superman clone is destroyed by Lois using a cyclone blast from her hand. In Superman: Red Son, Lex Luthor chose to create his own version of Superman through cloning to combat and overcome the original. Luthor decided to crash Sputnik into Metropolis which will bring Superman to the event and hopefully allow Luthor to gather genetic material of Superman. As planned, Superman arrived in time to stop the deadly crash. The United States government claims the probe and Luthor obtained the samples he needs in order to create his copy which proves to be defective and was named "Superman 2." Luthor sent Superman 2 off to engage Superman who was attending a state party which Wonder Woman was also attending. Superman 2 clashed with Superman over the English Channel and the two fight. Their battle was so aggressive it accidentally caused an American nuclear missile to launch. Superman 2 proves himself to be a true genetic descendant of Superman as he sacrificed himself to save millions from the nuclear explosion. In Justice, Bizarro was created by Lex Luthor, in an attempt to use early cloning technology to find a means to kill Superman. The results were less than perfect. Once fashioned, even Luthor was incapable of controlling Superman's would-be duplicate. He is shown to have freeze vision, heat breath, and loves creating destruction, but isn't as intelligent as Superman and is a member of the Legion of Doom. He's based on the Silver Age version of Bizarro. Several alternative universe versions of the character exist: A Legends of the Dead Earth story set in the far future features a former media-star Bizarro who owns an amusement park and who fights against his own obsolescence. The Elseworlds one-shot The Superman Monster (1999), essentially a Frankenstein pastiche, features a monstrous copy of Bizarro created by a Viktor Luthor based on the remains of the infant Kal-El, who died upon arrival. In the limited series JLA: The Nail, having found Kal-El's ship, Lex Luthor uses DNA samples to create Bizarro-like duplicates, which he disguises as the "Liberator" robots to hunt down the supposedly rogue metahumans. While the Liberators possess Superman's powers in terms of strength and speed, their genetic structure proves to be unstable, to the point that they collapse after sustaining even minor damage in combat with metahuman foes, relying on stealth and superior numbers to overwhelm their prisoners. In the prequel comic to the video game, Lex Luthor comes up with the idea of creating a clone of Superman that can combat the corrupt Man of Steel. However, the clone escapes before the process can be completed, resulting in the clone having gray skin and diminished mental capacity. The clone travels to Germany where he meets a man who confuses it with Superman, making the clone assume this is his identity. Giving the clone a Superman suit with the S backwards, the clone goes on to try to establish peace—but because he lacks common sense and a basic understanding of human ways, he inadvertently wreaks havoc and kills Weather Wizard and Heatwave. The Trickster is able to take advantage of the clone's mental limitation to convince him they are friends and the "imposter" Superman is his enemy. The clone becomes known to the Regime, with Superman meeting him as Solomon Grundy is being captured. Yellow Lantern gives him the name 'Bizarro' since he proves to be an imperfect clone of Superman. Bizarro gets away before they can discover his origin. Trickster has difficulty keeping the clone in check, as the clone ends up killing an entire restaurant of civilians when he misunderstands Trickster's instructions. Trickster resolves to be more specific, but Bizarro accidentally drops him during flight, leading to Trickster's death. Not comprehending death, Bizarro takes Trickster's corpse to the German man who helped him. The man calls the Regime for aid, so Bizarro returns to the first place he remembers - Luthor's laboratory. Luthor realizes that the clone will inadvertently expose his work, so he sends Bizarro to the Fortress of Solitude, nominally for answers but in reality to be ambushed by the Luthor-controlled Doomsday. This leads to a fierce fight between the two, which is interrupted when the actual Superman arrives. The three-way battle tears across the Arctic with Luthor trying to prolong it by repeatedly switching Doomsday's assigned target, but he eventually realizes that he can't bring himself to murder even the corrupted Clark, and that Bizarro can't live to reveal Luthor's double agency. When Superman is briefly incapacitated, Luthor turns Doomsday on the unsuspecting clone and succeeds in killing him before having the monster stand down. Superman, furious, takes Bizarro's corpse to Luthor to run tests, not realizing his ally's complicity. In the 1st-season episode "Vatman" of Lois & Clark: The New Adventures of Superman, Lex Luthor creates a clone of Superman, being an adaptation of Bizarro. He is portrayed by Dean Cain who portrayed Superman as well. Bizarro appears in 7 episodes of the Superboy TV series which ran from 1988 to 1992, portrayed by Barry Meyers. This Bizarro is most like the original silver-age Bizarro, in that he was not truly villainous, but lashed out at society considering him a dangerous freak (indeed, Superboy often expressed his reluctance to attack his "brother" as they were of like powers). He was created when an experimental duplicating ray was overcharged during a lightning storm and Superboy was accidentally exposed to it. When Superboy and the ray's inventor gasp at what has been created, Superboy remarks "It is bizarre", to which the creation responds "Me Bizarro", so aptly named. Bizarro also took to wearing civilian clothes and the identity of "Kent Clark". He was in love with Lana Lang and kidnapped her, which forced Superboy to fight him. The inventor of the machine warned Superboy that the duplicates created soon explode and the same was going to happen to Bizarro. Superboy first attempts to stop Bizarro with kryptonite, but Bizarro's DNA is too dissimilar to be affected. The inventor then duplicates Krptonite, which is used on Bizarro, only to prevent his explosion and granting him a slightly more stable personality. The inventor then realizes being an antithesis that the duplicated kryptonite healed rather than harm. In his second appearance, Lex Luthor tricks Bizarro into attacking Superboy in exchange for a girlfriend. Luthor creates such girlfriend by duplicating Lana Lang, but the "Bizarro Lana" convinces Bizarro she cannot love one who aids wrongdoers, where Bizarro promptly defects to Superboy in thwarting Luthor. In his final episodes, Bizarro was made human by an experimental process that copied Superboy's brainwaves to his own brain. After extensive plastic surgery, Bizarro was totally human, with no super-powers, and took the name Bill Zarro. But the brainwave transfer left Superboy in a severely weakened state, and he was captured by a terrorist called Chaos, who intended to throw him off the top of a skyscraper to kill him. Bizarro was forced to reverse the process to get his powers back and save Superboy. Tom Welling seen in the 2007 Smallville episode "Bizarro". Bizarro appears in Smallville (2001–2011) played by Tom Welling. Introduced in the episode "Phantom", this version is presented as phantom of the result of a Kryptonian experiment that was imprisoned in the Phantom Zone until accidentally released by Clark Kent. The entity steals a portion of Clark's Kryptonian DNA and becomes an evil version of him, possessing all of his strengths but with an inverted version of his ability to absorb energy, its skin taking on a fragmented appearance when exposed to direct sunlight as it absorbs power from green kryptonite. The entity is defeated in the episode "Bizarro", when Clark is able to trap it on the sunny side of Mars. It returns in "Gemini" (attributed by the producers to the solar eclipse caused in "Blue" blocking off sunlight long enough for the clone to escape), taking an imprisoned Clark's place. After talking with Brainiac to try and find a cure for its weakness to sunlight, it is destroyed by blue kryptonite in the episode "Persona", the blue kryptonite overloading Bizarro just as it renders Clark powerless. The Supergirl version of Bizarro (Bizarro-Girl) appears in Supergirl, portrayed by Hope Lauren and Melissa Benoist. An unidentified woman, known only as "Jane Doe" and dubbed "Bizarro" by Cat Grant, is a brain trauma patient that was transformed by Lord Technologies into a clone, of sorts, of Supergirl. She first appears in the episode "Blood Bonds" as the pet project of Maxwell Lord, and later shows up in a costume similar to Supergirl's near the end of the episode "Strange Visitor From Another Planet." She picks up a vehicle from a bridge and tosses it, while the real Supergirl (Kara Zor-El) and her foster sister Alex Danvers watch on their TV set. Her story and origin are featured in the 12th episode, titled "Bizarro". Bizarro attacks Kara on her date with Adam Foster. Her skin cracks and turns gray-white when hit by kryptonite by Alex Danvers. She later kidnaps James Olsen, but is finally stopped by Supergirl and Alex with blue kryptonite bullets. Supergirl takes the incapacitated Bizarro back to the DEO where she is returned to a coma state until they can find a way to help her. This version isn't a clone, but instead was created by genetically altering a permanently comatose human female that closely resembles Supergirl and infusing her with Supergirl's DNA, which was picked up from the Red Tornado's broken arm. A total of seven girls were used by Lord for the experiment, the rest presumably discarded as failures. Bizarro is also alluded to in the 2018 Arrowverse crossover event Elseworlds, where in John Deegan's altered reality, a civilian refers to Superman as Bizarro during his battle with Deegan. Bizarro appears in Challenge of the Super Friends (1978), voiced by William Callaway. He appears as a member of the Legion of Doom. Bizarro appears in Super Friends (1980–1982), voiced again by William Callway. He was featured as solo villain in the episodes "The Revenge of Bizarro" and "Bizarowurld" (both 1981). In addition, he had a silent role in "The Revenge of Doom" where the Legion of Doom has gotten back together. Bizarro appears in The Super Powers Team: Galactic Guardians (1985–1986) episode "The Bizarro Super Powers Team" (1985) voiced by Danny Dark. This Bizarro resides in Bizarro World and was referred to as Bizarro #1. He travels to Earth where he uses a ray gun in his possession to create Bizarro versions of Wonder Woman, Firestorm, and Cyborg which Mister Mxyzptlk takes advantage of. Bizarro #1 later accidentally creates a Bizarro version of Mister Mxyzptlk. Bizarro appears in Superman: The Animated Series (1996–2000), voiced by Tim Daly. Lex Luthor creates a failed clone of Superman that resembles the original Silver Age version in appearance and manner. Bizarro appears in Justice League Unlimited (2004-2006), voiced by George Newbern. He appears in "Ultimatum" helping Giganta in an attempt to cause a prison break only to be defeated by Wonder Woman and Ultimen member Longshadow. In the final season, Bizarro appears as a member of Gorilla Grodd's extended Secret Society. Bizarro appears in DC Nation Shorts (2012–2014) as part of the Tales of Metropolis short "Bizarro", voiced by David Kaye. Bizarro appears in the Justice League Action episode "Booray for Bizarro," voiced again by Travis Willingham. His history of being unsuccessfully cloned from Superman by someone has been mentioned. Wanting to join the Justice League, Bizarro is shown having taken Wonder Woman on a "date" to a miniature golf course where his striking at the golf ball caused damages to the miniature golf course. When Amazo attacked the Justice League Watchtower, Bizarro followed Wonder Woman to the Justice League Watchtower to help. After Wonder Woman gets trapped by Amazo, Bizarro flies off to get the "smartest man in the galaxy" who turns out to be Space Cabbie. As Space Cabbie struggles to free the captive Justice League members so that they can cancel the message that would lure the other Justice League members into a trap, Bizarro fights Amazo where his backwards lifestyle overloads Amazo. Afterwards when Bizarro wanted to join the Justice League, Batman states a condition of joining that would cause Bizarro to do the opposite by leaving the Justice League Watchtower. According to writer Mark Rosenthal's commentary of Superman IV: The Quest for Peace, released on the 2006 DVD, there are approximately forty-five minutes of deleted scenes cut from the film that have not been seen by the general public. Cut scenes featured a different version of Nuclear Man (portrayed by Clive Mantle) engaging Superman in battle outside the Metro Club and being destroyed by the Man of Steel. This version of Nuclear Man resembled in looks, and significantly in personality, to Bizarro. In 2007, film director Bryan Singer reported that he wanted to use Bizarro, along with Brainiac, as an antagonist in the film Superman: The Man of Steel, the sequel for Superman Returns. Bizarro appears in JLA Adventures: Trapped in Time (2014), voiced by Michael Donovan. He appears as a member of the Legion of Doom. Bizarro, Toyman, and Cheetah, and Solomon Grundy go back in time to Smallville to send baby Kal-El back into space to prevent him from becoming Superman. They are thwarted by Cyborg, Aquaman, and The Flash. Bizarro appears in Lego DC Comics Super Heroes: Justice League vs. Bizarro League (2015), voiced again by Nolan North. Rather than his usual role as an antagonist, Bizarro is portrayed as a well-meaning klutz desperate to help Superman look after Metropolis. His origin is explained as Lex Luthor hit Superman with a duplicator ray in order to create a clone he could control. In order to prevent Bizarro from causing any more destruction, Superman takes him to a strange planet which he calls, "Bizarro World" where Bizarro defends yellow crystals with faces carved into them. When Darkseid starts collecting the yellow crystals, he returns to Earth and steals the Duplicator Ray which he uses to create Bizarro versions of Wonder Woman, Batman, Cyborg, and Guy Gardner called Bizarra, Batzarro, Cyzarro, and Greenzarro. Bizarro later created a Kryptonite bomb to help save Bizarro World. After realizing his intentions, the Justice League and Bizarro League team up and defeat Darkseid and save Bizarro World. Bizarro appears in Superman (1999). Bizarro appears in Superman: The Man of Steel (2002). Bizarro appears as a playable character in Superman Returns (2006) voiced by John DiMaggio. Bizarro appears in DC Universe Online (2011) voiced by Joe Mandia. Bizarro appears as a bonus character in Lego Batman 2: DC Super Heroes (2012) voiced by Travis Willingham. Bizarro appears as a support card in Injustice: Gods Among Us (2013). Bizarro appears via DLC as a playable character in Lego Batman 3: Beyond Gotham, voiced by Nolan North. His DLC map has Bizarro leading the Bizarro Justice League into saving Bizarro World's "citizens" from Darkseid's forces. Bizarro appears in Injustice 2 (2017), voiced by Patrick Seitz. He appears as a playable character, via a premier skin for Superman. While Bizarro basically has the same moveset as Superman, certain abilities are alternated such as Heat Vision being replaced with Cold Vision and Heat Breath replaces Superman's freezing super breath. Additionally in pre-battle intro animation the handcuffs he wears have a piece of Blue Kryptonite instead of the Green Kryptonite that appears in Superman's version of said intro, though Bizarro is able to break the handcuffs just as Superman does. Bizarro appears as a playable character in Lego DC Super-Villains, voiced by Nolan North. Warner Bros. Consumer Products collaborated with Livobooks to produce the first Superman interactive motion comic Mobile app "Superman and Bizarro Save the Planet" on iOS and Android. Bizarro is the name of a steel roller coaster at Six Flags Great Adventure. In "The Bizarro Jerry", the 137th episode of the American television sitcom Seinfeld. The title and plot extensively reference the Bizarro (the polar opposite of Superman) and Bizarro-Earth concepts. Jerry calls the boyfriend Kevin and his acquaintances, Elaine's "Bizarro" counterparts exhibiting kind & considerate behaviour as the opposite of Jerry, Kramer, George, and Newman. ^ "Correction". Newsfromme.com. 2011-11-20. Retrieved 2016-09-24. ^ "The Speeding Bullet". The Speeding Bullet. Archived from the original on 2010-02-02. Retrieved 2016-09-24. ^ a b Conroy, Mike. 500 Comicbook Villains, Collins & Brown, 2004. ^ This material has been collected as Superman: Tales of the Bizarro World, DC Comics, 2000 (ISBN 1563896249). ^ "The Unofficial Bizarro Chronology". Dcuguide.com. Retrieved 2016-09-24. ^ In the digital numbering, this story is serialized in Adventures of Superman #25-27; in print it is the single-issue Adventures of Superman #9. ^ Burlingame, Russ (December 20, 2015). "Bizarro To Appear On Supergirl". Comic Book. ^ Marston, George (January 11, 2016). "BIZARRO SUPERGIRL Confirmed For CBS's SUPERGIRL". Newsarama. Retrieved January 11, 2016. ^ "Supergirl Season 1 Episode 12 Review: Bizzaro". TV Fanatic. Retrieved 2016-09-24. ^ Williams, Owen (2013-06-21). "What happened to Superman IV's Nuclear Man? - Yahoo Movies UK". Uk.movies.yahoo.com. Retrieved 2013-09-29. ^ Lentz, Harris M. (February 1989). Science fiction, horror & fantasy film and television credits supplement: through 1987. McFarland. p. 598. ISBN 978-0-89950-364-6. Retrieved 27 March 2013. ^ "Superman and Bizarro Save the Planet". www.livobooks.com. Retrieved 10 July 2014. Supermanica: Bizarro-Superboy Supermanica entry on the original Pre-Crisis character.